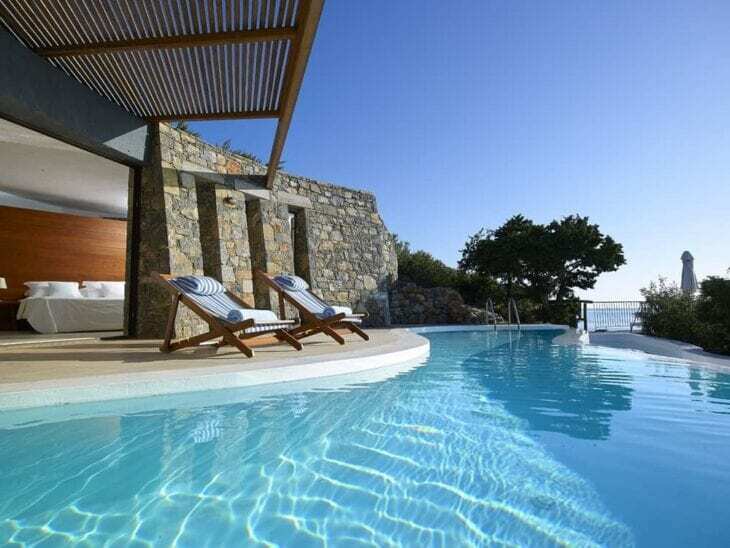 Crete’s rugged natural beauty makes it the perfect setting for indulgence and luxury. 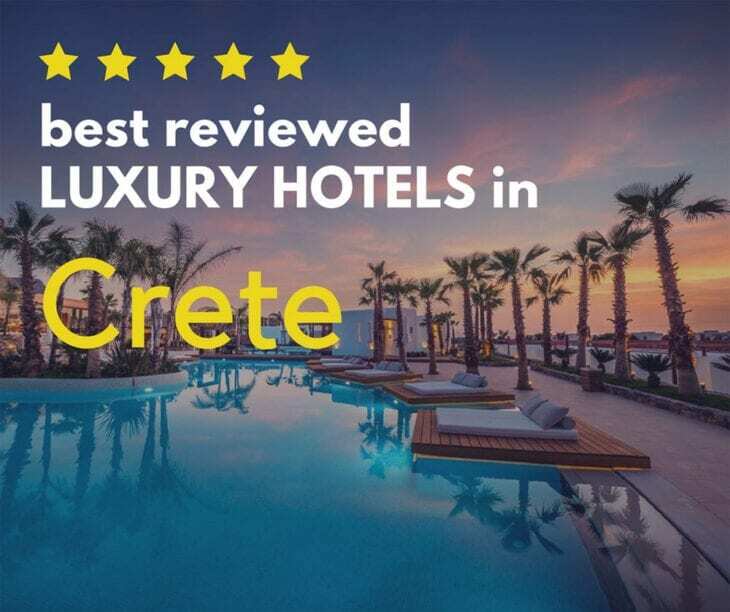 We have compiled a list of the 13 best luxury hotels of Crete based on the guests’ ratings and reviews. 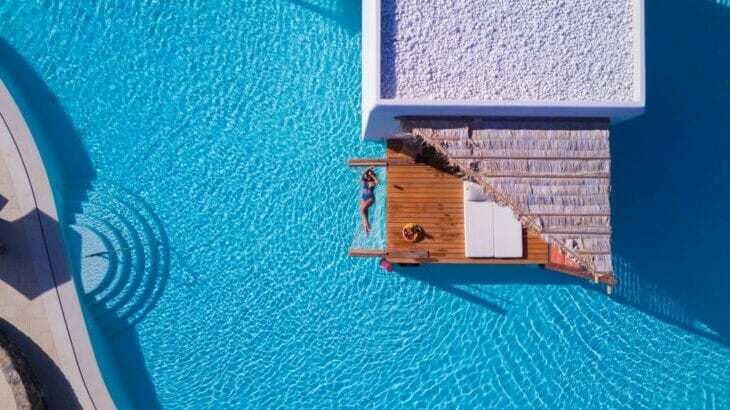 In the prefecture of Agios Nikolaos, this splendid resort combines an exotic and exclusive natural setting – a cove in Vathi – with contemporary elegance. The sea water infinity pool suspended over the Mediterranean will make you gasp with delight. Six restaurants and bars will satisfy your every appetite – from traditional delicacies with a contemporary twist, to nouvelle cuisine. Full spa services complete the luxury experience. Between Agios Nikolaos and Elounda, this hotel really does offer something for everyone — their lifestyle “menu” has offering for every lifestyle. The Active Lifestyle includes of course water-sports, plus scuba diving in these gorgeous and fascinating waters; the Cultural Lifestyle features thematic exhibitions and an art gallery, plus a Cretan museum. A mini club serves the needs of families with childcare and activities, while the Happy Lifestyle provides everything you need for celebrating your most special moments. Sail and motorboat cruises introduce you to Crete’s secret beauty. A host of dining options, beautiful facilities, and luxury accommodation complete the experience. Just 7 km from Agios Nikolaos, this hotel has a great reputation. At the edge of Mirabello Bay in northeastern Crete, with 20 acres of beautiful gardens, this splendid resort is known for the excellence of its service. Variety of room decors ensures each guest has the perfect surroundings. The resort’s variety of restaurants also cater to every mood- from the casual atmosphere of a classic seaside taverna “Ariadne” to the elegance of the more formal “Thalassa” and other choices in between. 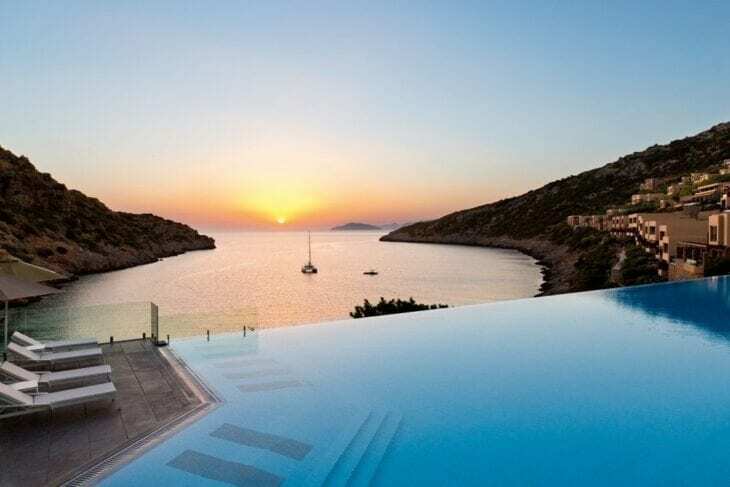 Domes of Elounda redefines the true meaning of luxury with their “Haute Living” concept. Spacious villas and residences with ultra-luxurious décor come staffed with a villa manager to see to your every wish, 24/7. First class services are accompanied by access to an all inclusive lounge for the exclusive use of the Haute Living guests- be it for wellness and serenity, or your business needs. You can also enjoy a unique array of dishes at any of the four upscale restaurants- Tholos, Yaosai, Topos 1910, and Blend. Enjoy the view of Spilonga Island and the fabulous Aegean from your private, reserved sun lounge on an exclusive beach. Modern Mediterranean elegance captures the unique ambience of this most enchanted corner of Crete’s Agios Nikolaos prefecture. Stella Island Luxury Resort and Spa, an adults’ only (15+) Luxury experience, offers sophistication and total relaxation. How close do you want to be to the water? They have modern, chic bungalows suspended directly over the water’s surface — go from your private veranda directly into the elegantly designed, enormous pool. Or perhaps you prefer your own private pool- that’s an option, too. Elegant restaurants promise glamorous evenings. The luxury of privacy also awaits guests of the new Nanna Princes, where nearly all of the properties have their own sea water pools. Design is refined, ultra-contemporary elegance. The goal of the Nanna Princess is total wellness- spa, exercise, beauty and hair therapies. Leave looking as great as you feel, and feeling thoroughly pampered. They pride themselves on the excellence of their service, treating everyone who steps through their doors as a VIP. 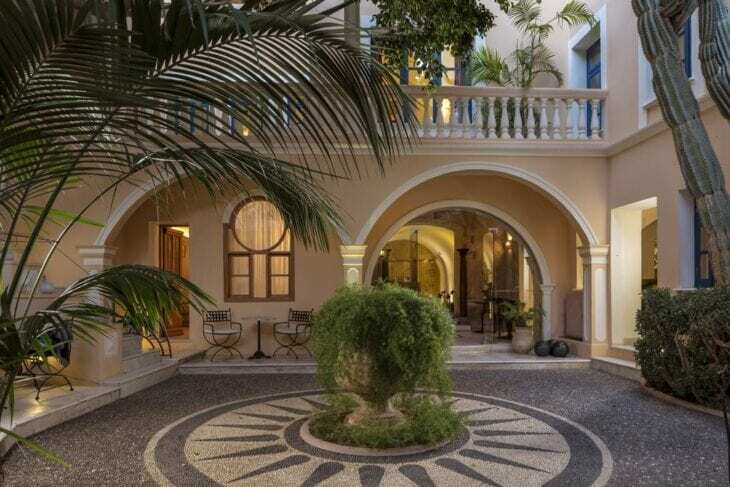 In the romantic old town of Rethymnon, full of Venetian charm, this boutique hotel capture’s the city’s magic. Awash in soft pastels, the Palazzo dates from the Venetian occupation of Crete — 1200–1600, with some exotic Ottoman era additions. Imagine sleeping under a high stone barrel vaulted ceiling, or swimming in a long pool in a secret courtyard. The Rimondi Estate offers more luxury accommodations and a unique architectural experience. Enjoy the finest that charming Rethymnon has to offer from the luxury and comfort of the Anemos Luxury Grand Resort in Georgioupolis. Get to know the area through experiencing watersports, cycling trips, boating and sailing excursions. The décor is unique- sumptuous, colorful, elegant- contemporary with touches of the Cretan and the exotic. Rooms, suites, and duplex maisonettes are spacious and well-appointed. The finest of Cretan gastronomic experiences is assured by the Cretan born executive chef Nikos Kamitsos- combining traditional ingredients and techniques with modern sensibilities. Five chic restaurants offer their own novel atmospheres, and there are also four stylish bars, poolside and indoors. Enjoy the four outdoor swimming pools from the comfort of your sunbed or a private cabana. There is also a heated indoor pool. And the beach experience has never been more luxurious- private gazebos and cabanas can be reserved. Personalized treatments at the “Aura” spa, using local Cretan and Greek products, will leave you radiant inside and out. 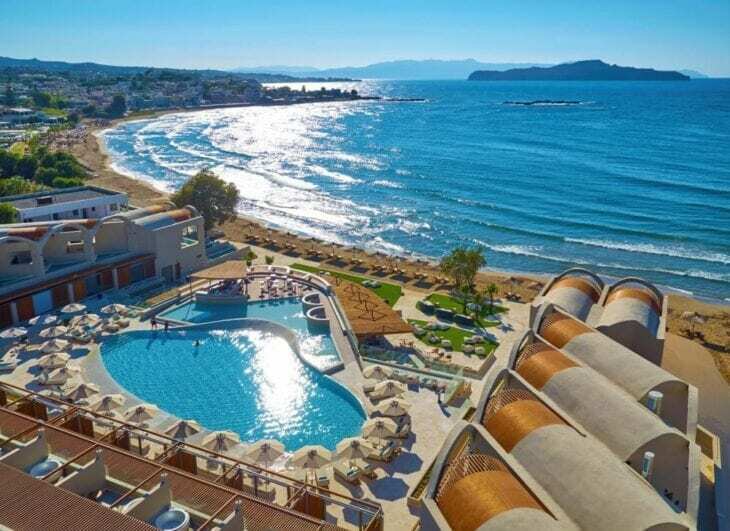 The complete family experience of Crete begins at Grecotel Creta Palace. For swimming you’ll find no lovelier sea. Or enjoy the resort’s beautifully landscaped pools, complete with a children’s pool. Activities are endless! 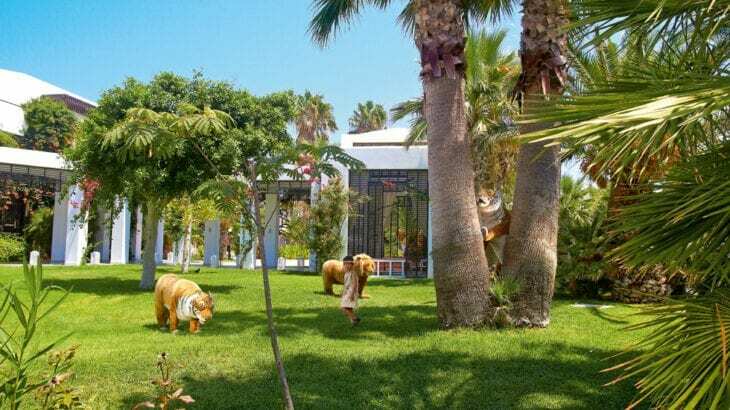 Children will be delighted with a playground, children’s cookery classes, and being a “Farmer for a Day” learning about traditional Cretan life at Agreco Farm. Parents’ activities include, in addition to the usual and fun watersports, Aerial Yoga and shooting. Indulgences like luxury spa treatments and even boutique shopping make your stay complete. There are ten unique venues for food and drink- from a classic “Kafenion” to elegant restaurants. Rethymno’s south coast is famous for its pristine, untouched beauty- a remote location the discerning traveler seeks out. This is the perfect mix of privacy and personal service. Your studio, of stone and pure white simplicity and elegance, has everything you need for a private breakfast. The studios- just four of them- share a pool. All have a fabulous mountain view. A villa on top of the hill with its own private pool accommodates a party of six. The Galini Breeze hosts get-togethers twice a week with drinks and snacks so you can swap stories and tips with the other guests. The waters of Agia Galini’s beaches on the Libyan sea are famously clear and crisp, and the brightness of the stars at night is dazzling! Your luxury boutique experience of Crete at Domes Noruz- part of Mariott’s Autograph Collection- will leave you transformed. This adults’ only lifestyle resort is experience-oriented, a wellness retreat in every sense. Domes Noruz offers full fitness facilities, with rip training, cycling, pilates and other wellness activities. Keep your own schedule- the fitness facilities are open 24 hours a day. Then pamper yourself with a delectable menu of spa treatments to keep the glow going. Feed your spiritual and intellectual wellness with art and culture- dance performances, music. Restaurants present the finest of the Mediterranean diet- the freshest local produce and just caught fish plus local Cretan delicacies meet at the table at Zeen. Or try the Raw Bar for sushi and cocktails, set between the pool and the Aegean, for a sunset, and some music. Private luxury villas have their own distinctive personalities: the Upbeat Retreat, the Wellness Loft, and Ultimate Heaven are among the choices. Service is fabulous- you will want for nothing. Chania is full of romantic Venetian charm- a wonderful destination to explore. 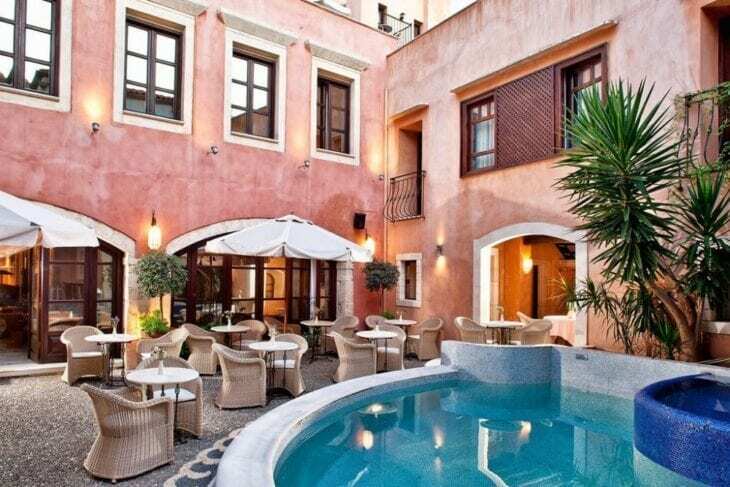 A long-time favorite of fans of truly authentic luxury experiences, the Casa Delfino is set in the very heart of Chania’s Venetian old town. This elegant hotel is not named for dolphins, but for the Genovese shipowner and knight who came ashore during a storm in 1835. It’s a personal experience: the suites here have names- like the Ottoman Suite with its private marble hamam, or the penthouse suite, with a view of Chania’s famously beautiful, romantic harbor. Traditional and modern furnishings blend stylishly together to make a pleasing and unique design experience — tasteful and gorgeous. If your idea of luxury is total privacy, then this special property owned by the Casa Delfino is an ideal choice. Located outside of Chania on the lovely Akrotiri peninsula, this mini estate villa can host 16 comfortably — 14 in its large villa with seven bedrooms with four baths, plus the another two in the small private villa. The rooms are elegantly and traditionally furnished, with contemporary modern baths. Enjoy sea views from the large veranda, or lounge around the private heated swimming pool. This is a wonderful place for a large family get together or a memorable holiday with close friends. 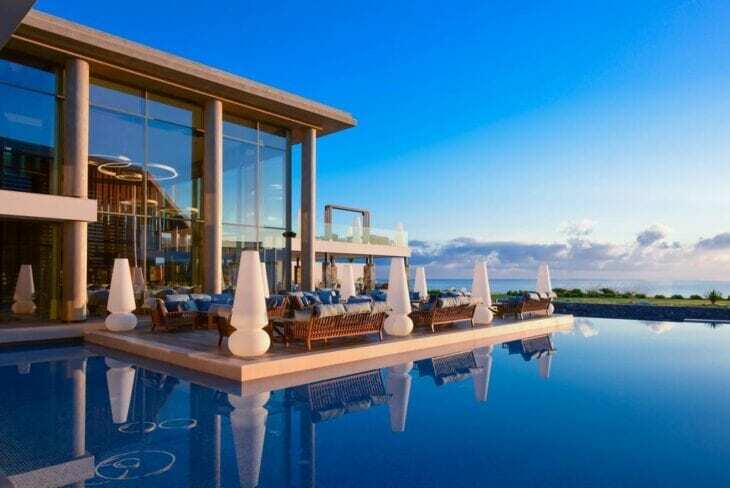 Do you have a favorite hotel on Crete? 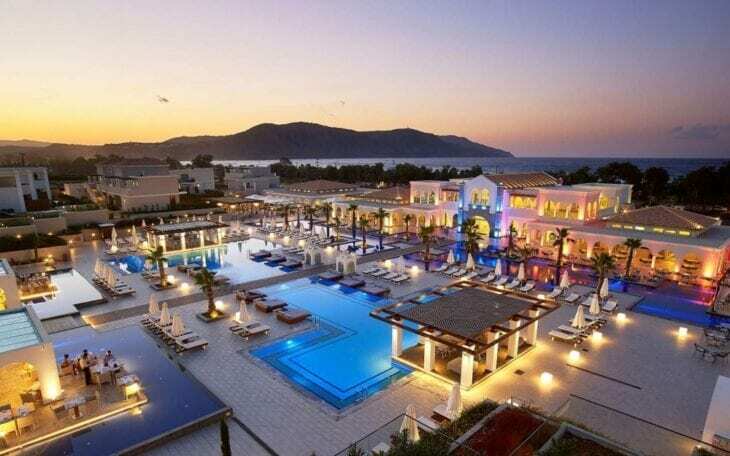 If you are visiting Crete for the first time, we hope that you find our guide to the best luxury hotels of Crete useful.